It’s great. You can live out your basketball fantasy as a coach, as a fan of it, it’s been great. These players out here, you could tell them to do something once. And they perfect it. They find a way to perfect all of the options out of it. They’re great basketball minds and just great self-motivators, and it’s great to be around this type of atmosphere. What was the overall objective? We want to get a little bit more comfortable with the sets we’re running from an offensive standpoint. We didn’t do a whole lot of defense, but obviously they can understand the effort is there. When we start putting in specifics as to how we want to play certain things, we’ll start doing that. But, the most important thing is to gain some offensive chemistry, and also get a really good look at some of the younger players to see if they can acclimate well to the core of players who have already been Olympians. I don’t know, that’s up to the committee. I don’t get a vote. Obviously I have a voice in it. They can listen or not listen. They’re trying to put together a team that will compete and win a World Cup first and then the Olympic (decision) is a little bit later. What was your parting message to the team? The biggest message is (about) their time. I value their time. They’re sacrificing coming back from overseas. Some of them are coming back from injury, and they decided to come. 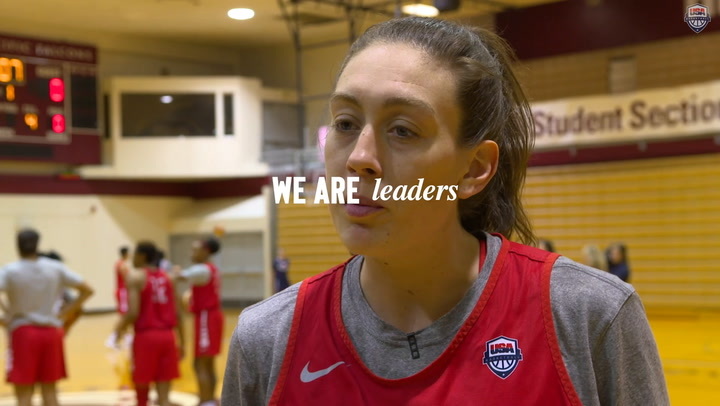 So, I’m thankful that they decided to do that, because we’re only as successful as the amount of good players that we can get in here to bond, to forge that chemistry that we’ll need to continue to be successful in international play. How would you rate your coaching staff this weekend? The coaches that we have here, these are world-class coaches. They’ve won WNBA championships. I’ve been fortunate to work with Cheryl Reeve in a lot of different capacities. With USA Basketball, she coached me when I was on the Sting. They’re all great basketball minds, and I know in these types of situations, I’m learning. You just don’t stop learning. They add different options, different suggestions to what we’re doing. They’ve been great, and I’m open to it, because I don’t want to leave any stone unturned. 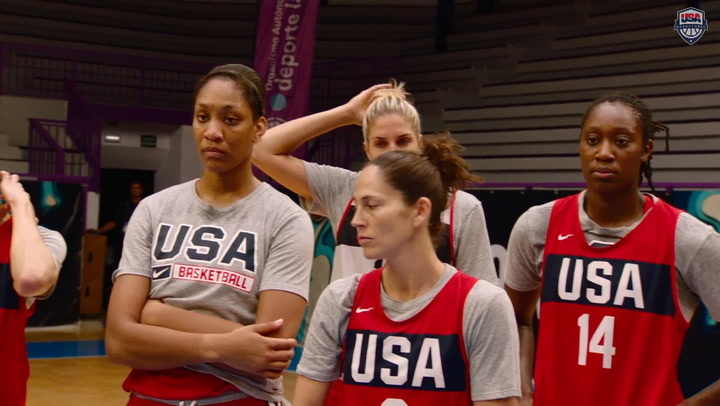 I want to put the best product on the floor, so we can continue to win gold medals. What did you and the rest of the team get out of the minicamp? These camps are intriguing because we have a lot of new players, it’s only three days, we’re trying to get a lot done and in some ways, it’s less about basketball and more about chemistry. Of course we want to add offenses and we want to add defenses, but we want to get the chemistry going on the court. But … it takes time. Something that you can really work on at these camps is just getting to know each other better. When you find that you build those relationships, the Xs and Os get a little bit easier. Yes, we got a lot done, basketball-wise, but it was really good just to be around everybody and take what we got from this camp and build on it at the next one. What were your thoughts on the competition at practice? It seemed ultra-competitive? I thought it was great. I think the committee is going to have a really hard time choosing the 12 (for the 2018 FIBA World Cup). But, I thought it was really great. I think Dawn (Staley) did a great job with the atmosphere, explaining what she is looking for. And, the on-court coaches with Brian Agler, Cheryl Reeves and Dan (Hughes), they did a great job as well, assisting. On getting back together with this group that includes so many familiar faces for you? It was really great, especially some of the UConn players, crossing paths with them in my career, and the other players that I haven’t gotten the chance to know, like Courtney Williams, Brittney Sykes, Allisha Gray, so that was really neat. That is something that I really love, just the camaraderie. Did you guys do anything fun off the court? No, not really. I think because of how hard the practices were, I was just laying low. Really great. Just the fact that I’ve been around, being able to nurture them and tell them little things, especially like Steph Dolson, Elizabeth Williams, Morgan Tuck, just to be there are far as a presence to help them. I know Sue (Bird) was doing the same things with the guards. What did you think of being here under coach Staley’s leadership for the first time? It was great. I’m in awe of her, just her accomplishments, where she is, being a player, knowing what it’s like. I’m really happy for her. I was really excited to be there with her. I know it’s going to be great. How was the training camp for you? It was great to be able to play with you’re used to competing against is amazing. It was amazing competition everywhere you looked. You didn’t have to create your own shot, it just comes naturally with the people you have out there on the floor. So, it was good for me to be able to go up and down with such elite athletes. It was a great atmosphere. Dawn is a great leader. She has a great mind-set in the way she communicates with us, add she wants our level of play to just keep going up. I loved the level of experience and everybody around it. How was the camp this weekend? This camp was great. I really enjoyed it. I had a lot of fun. Dawn was great. It’s a lot of youth on this team and it just adds that explosive component that’s needed for USA Basketball. You’ve got to think about it, those young kids from London and Rio, we’re in our 30s now (laughs). So, we’re getting up there! Me, Maya and others, we were the young ones when we started out, and now we’re the older vets. It’s good to see these young ones come in hungry. It’s a good addition and a real pleasure to see. Do you feel the burden on your shoulders to pass along the knowledge you learned when you were a rookie? Not at all. A veteran, it’s kind of like being a captain. You paid your dues. There’s nothing hard about that. All that blood, sweat and tears is from when you were younger. You’re past all that now. This is just a teaching moment for the young ones. I’m excited to say, ‘do this like this’ or ‘do it that way’ because someone did that for me, and it’s a great feeling. They were listening and really into it, which is good. How would you describe the competitiveness out here? That’s my favorite part of coming to camp, the competitiveness is great. To be competitive within what we’re trying to do, working it all out and getting there day-by-day is just rewarding to see. When you get good work done and you can leave and you’re sweaty and everybody’s competed and grown a little bit. As a vet, I really appreciated these last few days. You all make it look so easy. Is that the case? That’s a testament to the players here, how we focus and lock in, in order to take advantage of this time so that we can connect. But it is hard. Today there were some moments of sloppiness and disconnect, because we’re still trying to figure out the pace together with new players, with old players, it’s a challenge. But then there’s that moment when you go, ‘Yeah, we know how to play the game.’ And it just clicks. Those are the moments you look forward to. What was Dawn Staley’s message to the team at the end of today’s practice? First, she thanked us for our effort and our competitiveness. It was very evident, you could feel it throughout the gym of how hard we worked. 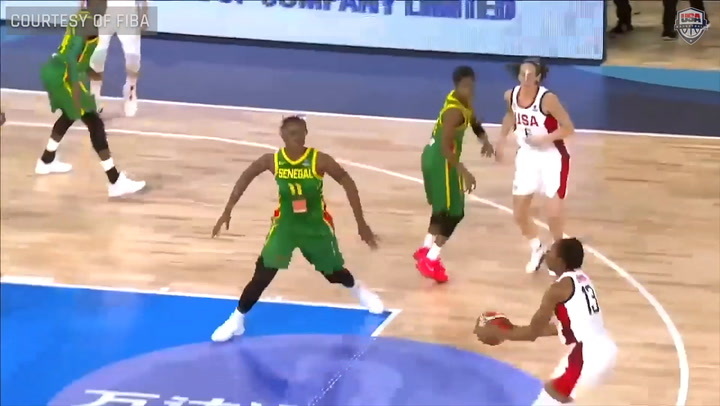 We need to clean up our offense, tighten up defensively, being able to play without fouling and continuing to take care of the ball, those little things that make a huge difference on the international stage. She was celebrating us as players and letting us know that she appreciates us and wants us to bring the same effort in the next training camp. What did you get out of your first USA National Team experience? Wow. I think it’s been since I was 19 since I’ve been with USA Basketball (at the 2013 USA U19 World Cup Team trials). So, it’s a long time coming. Being in this atmosphere again, being with the greats and just learning. There was a lot of knowledge thrown around from veterans to coaches. It was fun. We had our mistakes, but this group is so close-knit and all bounce off each other with all the energy. We never had a negative moment, so that was really good. What did you learn from some of the veterans? For sure Sue helped me and all the other first timers who are new to this type of system to just see the floor, slow down, slow the pace. DT (Diana Taurasi) talked to me on the bench about shot selection, just being smart. Tina (Charles) talked to me about trying to get the ball into the post and just the angles and everything. They were never hard. They were stern, but you understood that they were trying to make you better. That helped a lot.